Chris Grayling has kept his job as transport secretary after Monday’s cabinet reshuffle, following a bizarre mix up that saw him briefly announced as party chairman. 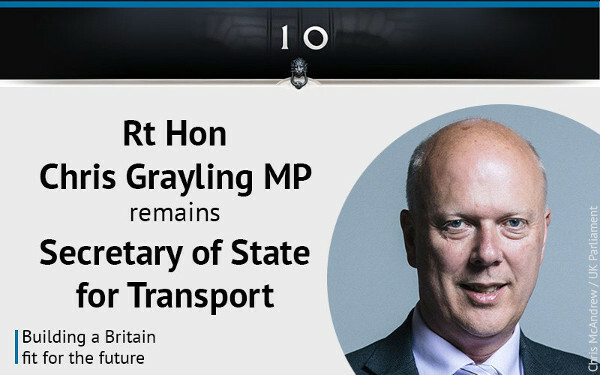 In what turned out to be a more limited - and less orderly - reshuffle than trailed, it was initially tweeted that Mr Grayling would become chairman of the Conservative Party, replacing former transport secretary Patrick McLoughlin. However, the tweets announcing this move were quickly deleted and on Monday evening it was announced that Mr Grayling would remain in post. Communities secretary Sajid Javid also remains in post, albeit in a local government department that has been rebranded to emphasise a renewed focus on housing. Mr Javid remains at the helm of a department that always had housing in its brief but has now been renamed the Ministry of Housing, Communities and Local Government (MHCLG). The ‘housing secretary’ said: ‘Building the homes our country needs is an absolute priority for this government and so I’m delighted the prime minister has asked me to serve in this role. Other senior figures in the cabinet kept their jobs, with Philip Hammond remaining chancellor, Michael Gove staying on as environment secretary and no change at the Foreign Office or Home Office. Jeremy Hunt kept his job at health after reportedly refusing to move, albeit with the new title of secretary of state for health and social care. However, Justine Greening left the Government after refusing to move from education to the Department for Work and Pensions. Number 10 said the reshuffle meant that 10 women will now attend cabinet. However this includes ministers below cabinet rank such as former rail minister Claire Perry, now minister of state at the Department for Business, Energy and Industrial Strategy, where Greg Clark remains secretary of state. On Tuesday, Jo Johnson was appointed minister of state at the Department for Transport, replacing John Hayes, and minister for London. He is the brother of former London mayor Boris Johnson. Jo Johnson was previously minister of state for universities, science, research and innovation. He was elected Conservative MP for Orpington in May 2010. The DfT said his ministerial responsibilities will be confirmed 'in due course'.